In May of last year, I blogged about the Continuous Crochet Motifs method of making and joining motifs so there are less ends to weave in at the end of the project. This is a really cool crochet technique/method. You can read that blog post here and see photos of the Japanese crochet book that I bought to learn this crochet technique. Since then, I purchased Kristin Omdahl’s book called “Seamless Crochet”. I haven’t had the time to make anything from that book, but it’s definitely the same method of joining motifs as in the Japanese book I bought. 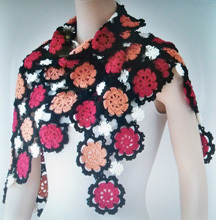 I still need to take some new photos of this shawl with the edging added before I can publish this pattern. But I promise to get to it sometime soon! I’ve veered from my original topic of the Continuous Crochet Motifs method a little, so I’ll get back to that topic now. After designing the shawl, I designed a scarf using the same Continuous Crochet Motifs method and some of the same motifs as the shawl. It’s called the “Byzantine Scarf”. I just finished up the pattern and added it for sale here yesterday. You can see the pattern here. What I love about this scarf (besides the colors) is the Continuous Crochet Motifs method I used for the 2 rounds of black, which are joining the red and orange motifs together (not the final round of black, but the black rounds inside the lime green rounds). With this method of crocheting, I was able to work these 2 rounds of black edging around each of the 15 motifs in the scarf in one long pass! And that means I only had 2 tails of black yarn to weave in on these 2 rounds. Okay, I realize that the rest of this scarf has plenty of tails to weave in. But by using the Continuous Crochet Motifs method of joining the motifs, I saved myself 28 whole tails to weave in (30 – 2 = 28). I don’t know anyone who enjoys weaving in the tails/ends on their crochet work and I don’t, either. But it’s a necessary evil and has to be done! I love using color in my crochet designs, so I’ve been known to weave in hundreds of tails on larger projects with multiple colors. I just bite the bullet and do it! I realize that not everyone wants to learn a new crochet technique, so I included the instructions for joining the motifs in the traditional motif joining method (joining with a sl st to the adjacent motif). But when you join the motifs this way (in the traditional method), you’ll have 30 tails of black to weave in on these 2 rounds of motif edging (2 tails for each of the 15 motifs in the scarf). So to me, it’s a “no brainer” to use the Continuous Crochet Motifs method to join the motifs together! But I’m an adventurous crocheter and I love to learn new techniques. I’m sure that not everyone is as adventurous as me, so that’s why I included the instructions for joining the motifs the other way. Now you can see the 2 rounds of black around the red and orange motifs better. I also made a symbol crochet chart for each method of joining the motifs (these charts are included in the pattern). So if you like symbol crochet charts and learning new crochet techniques, you might want to give this scarf pattern a try! These swatches haven’t been blocked, so they don’t look as good as they could. What I want you to notice is the number of tails and the number of motifs in each of these swatches (I didn’t weave in any tails at all on them). Each swatch has 4, 7 or 9 motifs that are joined. But since I used the Continuous Crochet Motifs method to make these swatches of motifs, there are only 2 tails that would need to be woven in (if I were going to make these into projects). There would normally be 2 tails to weave in “per motif”! This is a HUGE time saver!!! It means I can spend more time crocheting and less time weaving in ends! Of course, it only works when you’re using the same color of yarn/thread for each motif (or to join each motif). But it’s not a bad thing to use 1 color of thread/yarn. It’s a design decision! And the savings in time it takes to weave in the tails is HUGE! I hope you’ve enjoyed this closer look into the Continuous Crochet Motifs method and will come back again soon. 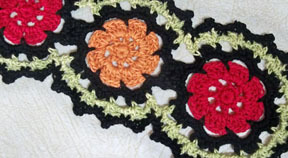 This entry was posted in Continuous Crochet Motifs, Crochet patterns, Crochet technique, Designing and tagged crochet, crochet patterns, crochet techniques, Designing, patterns, published design. Bookmark the permalink. I’m so glad that you enjoy my wiggly hot pads and coasters patterns. They really are a lot of fun to make! I have a list of where to find the other hot pad & coaster patterns on my blog post today (Sept. 7, 2013). 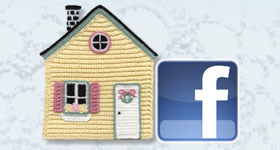 You might be able to find some of the Crochet World issues for sale on EBay or Ravelry sometime. Or I could suggest that Annie’s publish the other hot pad and coaster sets as PDF files on their website. The May set is available from Coats & Clark for free. And the September teacher’s apple set is available in a brand new book by Rita Weiss and Jean Leinhauser called “Treasury of Holiday Crochet”. I’m currently traveling in Japan and I just got one of these books! I love the patterns… but I’m confused about the technique. Could you explain some of the simple aspects of the patterns? Specifically, what does the filled-in stitch mean, is it a slip stitch? Also, what does the orange stitch mean? 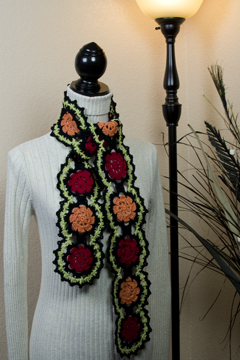 I would be happy to help you with these continuous crochet motif patterns! The simplest aspect of these continuous crochet motif charts is the fact that you don’t have to finish off each motif and start the next motif, which would give you 2 ends/tails to weave in for each motif. With the continuous crochet motif method, you only have 2 ends/tails to weave in when you’re done (or 4 or 6 ends/tails, depending on the size of the project and the amount of yarn/thread you have in each ball/skein and if you’re using just one color or multiple colors of yarn/thread)! Yes,the filled-in stitch is a slip stitch. I don’t see any orange stitches in the symbol crochet charts in my book, so I’m not sure what you’re talking about there. I do see some orange stitches in the diagrams, though. To me, these are orange because they’re trying to draw attention to the stitch being worked or the stitch(es) being worked into. That’s all! There are black, blue and red crochet symbols in the charts in my book. The black symbols are either a full motif or a partial motif that is worked from the center outward. The blue symbols (mostly chains) are how to get from one complete or partial motif to the center of the next motif without breaking the yarn. The red symbols are how to finish up a partial motif that wasn’t finished before. The numbers in parentheses are the motif numbers (start at motif #1 and progress from there – the arrows show where to begin motif #1). I can’t read Japanese, but I can follow symbol crochet charts quite easily! I hope this information has helped you learn to read these continuous crochet motifs charts! Thanks so much for this clarification! This helps a lot. I realized that the book I have is different than yours — maybe it’s a more recent publication by the same people who did the first one? I wish I could post a photo of a chart to show you the orange stitch. It basically looks like it crosses somehow… either over the initial chains (in blue) or the motif (in black outline). Knowing that the solid black is a slip stitch is a big help!